My friends over at Cackalacky, Inc. recently added Beer-B-Q™ Seasoned Snack Peanuts to its lineup of Southern lifestyle product offerings. 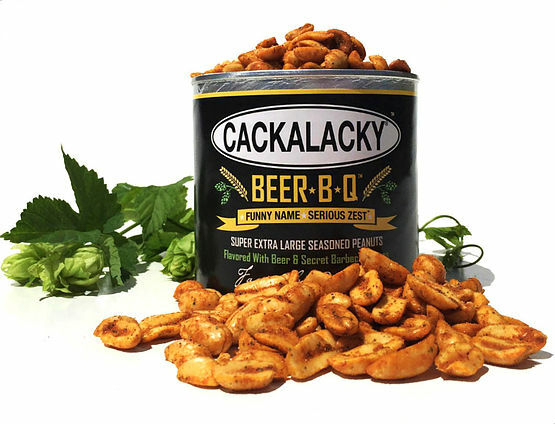 Cackalacky® Beer-B-Q™ Seasoned Snack Peanuts are super extra-large kiln-roasted NC-grown peanuts that are flavored with dried beer and Cackalacky’s secret blend of Famously Original™ barbecue spices. Beer-B-Q’s slightly sweet, lightly hoppy, and tangy barbecue seasoning flavor profile paired with roasted peanuts is a delightful celebration of “all things Cackalacky” as well as a savory contrast to the brand’s much more fiery Cackalacky® Spiced Snack Peanuts. Headquartered in Siler City, North Carolina and now celebrating its fifteenth year in business, Cackalacky, Inc. is a Southern lifestyle brand specializing in Cackalacky® branded and licensed sauces, flavored snacks, and craft beer as well as Cackalacky® brand apparel and outdoor sporting wares. Cackalacky products are available in grocery stores and specialty shops throughout the U.S. as well as via the company’s website at www.Cackalacky.com.